Chance and coincidence can be a bit weird and unsettling but you have to accept that it just happens from time to time. This morning in Newham, by chance I spotted a bundle of papers including musical scores dumped next to a communal recycling bin. I had a look and noticed that there was a single well preserved copy of the satirical magazine "Private Eye" from 1975 in the pile. Which I recycled and took away to read. Oddly, there was also some minutes from a 1986 Hammersmith and Fulham Conservative Party meeting. 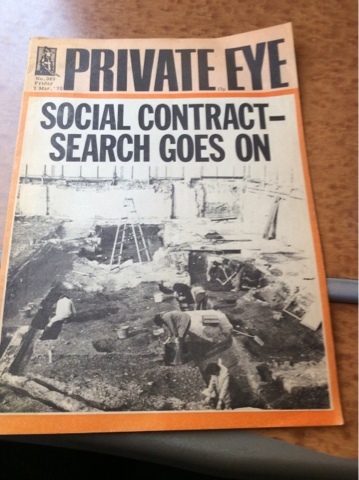 While very few people nowadays will have a clue what the joke was about on the front page regarding "Social Contract" (Goggle it and weep), the 7 March 1975 edition of this 41 year magazine was extracting the Michael about the forthcoming Referendum on the UK membership on the European Union that was also due to take place later that year in June. ....Well, I thought it was all a bit weird.